This is a USB 2.0 to 3.3V TTL UART 5PIN CP2102 Module Serial Converter. 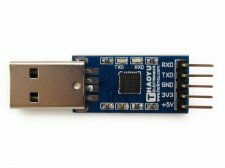 Connect MCU easily to your computer! Standard USB type A male and TTL 5pin connector. 5pins for TXD RXD GND 3.3V 5V.